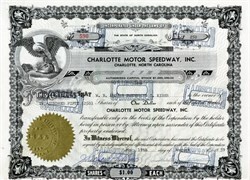 Beautiful stock certificate from the Charlotte Motor Speedway. Inc issued in 1959. This historic document has an ornate border around it with an image of an eagle. This item has the signatures of the Company’s President, Curtis Turner and Secretary, J. Richard Phillips and is over 55 years old. Charlotte Motor Speedway was designed and built by Bruton Smith and partner and driver Curtis Turner in 1959. The first World 600 NASCAR race was held at the 1.5 miles (2.4 km) speedway on June 19, 1960. In 1961, the speedway fell into Chapter 11 reorganization but quickly recovered despite the lagging ticket sales. Curtis Turner (April 12, 1924 – October 4, 1970) was an early NASCAR driver. In addition to his success in racing, he made a fortune, lost it, and remade it buying and selling timberlands. Throughout his life he developed a reputation for drinking and partying. In 1999, he was inducted into the Virginia Sports Hall of Fame. Turner was named one of NASCAR’s 50 Greatest Drivers in 1998. He was born in Floyd, Virginia and began his racing career in 1946 when he finished 18th in a field of 18 contestants in a race at Mount Airy, North Carolina. However, he rebounded and won his next race. During his career, he won 360 races in several different racing series, including 22 in the NASCAR Convertible Division in 1956, and 17 wins in the NASCAR Grand National series (now Sprint Cup). From 1950 to 1954, he drove for Oldsmobile being billed as the Blond Blizzard of Virginia. He switched to driving Fords in 1954. He eventually acquired the nickname of Pops, allegedly because of the way he would "pop" other drivers on the track. Turner drove a Holman Moody-prepared Studebaker Lark in the 2-hour compact car race accompanying the inaugural United States Grand Prix at Sebring, Florida, on December 12, 1959. He finished second overall, trailing the disc-brake equipped Jaguar 3.4 of Walt Hansgen. Turner conceptualized, secured financing for, and built Charlotte Motor Speedway in 1960 before being forced out by his business partners. Turner's 1967 Daytona 500 car designed by Smokey Yunick, seen to the right, was the inspiration for the car driven by the Talladega Nights character Reese Bobby. The car was banned by NASCAR thus starting Smokey's tenuous relationship with NASCAR. Being able to see the racing industry from the business end, he developed a feeling that drivers deserved a better deal for their role in the sport. Together with Fireball Roberts and Tim Flock, he attempted to organize a union for them, the Federation of Professional Athletes, in 1961. According to The Washington Post: "His aims are for better purses, a share in broadcasting rights and retirement benefits for the drivers." Unfortunately for him, NASCAR has never looked favorably on an organized union for the drivers, and Turner was banned for life. Turner continued to race under other sanctioning bodies, including the Midwest Association for Race Cars (MARC), even promoting his own 100-mile event on the dirt at Lakewood Speedway, Georgia, in October 1961. Tim Flock finished second in that event. Turner and Flock sued NASCAR and its president Bill France "seeking $200,000 punitive damages each and restitution for loss of earnings." "Attorneys for the drivers claim the ban represents a violation of state right to work laws because test driving contracts involving $150 a day plus expenses were canceled as a result of the action. NASCAR and France's attorneys contended the ban isn't a right to work violation because it doesn't involve an employer-employe relationship. They said Flock and Turner are individual contractors and not employes of NASCAR or any track." However, the ban was lifted after four years in 1965, and Turner returned to NASCAR racing. Bill France was in a bind and needed to mend some fences. 1962 and 1963 NASCAR-points champion Joe Weatherly was killed driving a Mercury at Riverside, California on January 19, 1964, and his star driver Fireball Roberts had died following a fiery crash on May 24, 1964, at the World 600 in Charlotte. The track owners wanted Turner back. "Turner was slated to drive for a newly-organized group, The Grand American Racing Association, organized July 31 in Sumper, S.C. Turner was due to compete in the first of 17 scheduled races at Concord, N.C. Aug 21." France was also short of cars. The Chrysler factory were boycotting NASCAR over the organizing body's ban of the Hemi engine, and Richard Petty went drag racing in the first half of the 1965 season. The Ford factory were also in dispute with NASCAR over the SOHC engine, which faced a joint NASCAR-USAC ban on December 17, 1965. Turner, then 41, soon notched the first victory of his comeback in a Ford at the inaugural American 500, at the North Carolina Motor Speedway, Rockingham, North Carolina, on October 31, 1965, winning a purse of $13,090. Turner lost his Ford ride in 1966 when: "Ford withdrew its factory backed racing teams from competition when the National Association for Stock Car Auto Racing and the United States Auto Club ruled April 6 that Fords equipped with an overhead cam engine must carry 427 additional pounds." Turner started the 1966 season in a Ford, but with the Ford-factory withdrawal, he signed to drive a Chevrolet for Smokey Yunick out of Daytona Beach, Florida. He died in an airplane crash near Punxsutawney, Pennsylvania on October 4, 1970. The crash also killed golfer Clarence King. "Police said the aero-commander 500 piloted by Turner crashed shortly after taking off from the Dubois-Jefferson Airport en route to Roanoke."